What was it about these dogs that made them so desirable? Their coats are not short and smooth, or lavish, or silky, curly or wiry, or unusually coiffed. In the field, Leonbergers are not exceptional hunters, trackers, retrievers, pointers or jumpers. No, Leonbergers are exceptional because they lack these very extremes of function and form that are the central appeal of many other breeds. Because they were not selectively bred to specialize in a canine sport or working task, they are not dazzling performers in any single arena. Their purpose in life is to be loving, watchful companions and family members. For me, the Leonberger is the perfect breed. I love their temperament, size, and beauty. But with the Leo temperament comes a need to be part of the family, not just a dog. The magnificence of their size leads to a bigger dog bed, a bigger vehicle, more food,and training is a must (unless you're interested in seeing firsthand what a "bull in a china closet" really means). The crowning glory of a Leonberger's beauty is their coat. A coat that, when shed, will gather in corners of your floor to form "hair puppies" and will adorn your furniture and also your favorite little black dress. So before you decide to bring a Leo into your life, do some research and make sure this amazing breed is for you. The Leonberger is a noble, powerful, yet gentle, dog. They are warm, big, soft, if necessary protective, companions, perfect for nestling into or clutching if you are a toddler. Leonbergers are sometimes affectionately referred to as "lean-on-bergers" because of their tendency to lean against their loved ones. However, Leonbergers are large dogs and are frightening to many people simply by their size. Fear and aggression in a stranger can activate a dog's protective instincts. Huge dogs can also do a great deal of damage just by jumping up on someone in a burst of enthusiasm. When you invite a Leonberger to share your life, you bring to that contract the responsibility to make sure that both you and your dog receive excellent obedience training. To become excellent family and watchdogs, Leonbergers must be well socialized as young puppies and well-trained and under the control of their people at all times. It is difficult to train a dog that has been improperly socialized. The fear of infections has led breeders and owners to make the tragic mistake of keeping their puppies isolated until they have completed their vaccination series; they risk ending up with a fearful, timid dog that may become aggressive as an adult. Owners must strike a balance: Puppies, especially from birth through four months, must be exposed to a variety of people and experiences. There are many activities and places to take dogs, and new owners have to take the time to expose their new pups to as many of these as possible. This is especially true for one's second and third Leonberger; it is too easy to keep the new pup in the company of the older dogs, depriving him of the opportunity to develop self-confidence. Leonbergers are known for their stability. As a general rule, they are consistently even-tempered and generally pleasing to be around even in noisy and chaotic situations that would be highly stressful for some other breeds. A typical and impressive sight at dog shows and gatherings is a large "pride" of Leonbergers peacefully and contentedly sitting and lying together in close quarters. Leonbergers are excellent watchdogs, not given to frivolous barking or unnecessary alarms. Their imposing size and deep bark are usually enough to deter uninvited guests. They instinctively establish and maintain their household's territorial rights. However, upon receiving the OK from family members, strangers are accepted and welcomed. 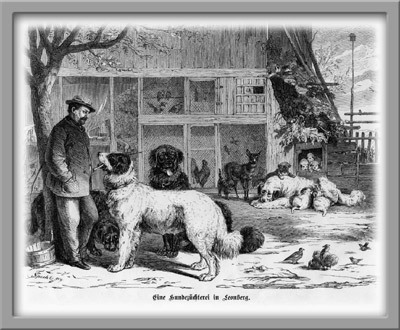 A Victorian Age Breed: The early history of the Leonberger is clouded and tumultuous, revolving around Heinrich Essig (1809-1889). Essig was a successful businessman specializing in animal trading. He was also a politician, an alderman and a prominent citizen of Leonberg, a town on the outskirts of Stuttgart in southern Germany. Essig and his family surrounded themselves with a variety of rare and exotic animals. In dogs, they preferred large and imposing breeds. He bought and sold dogs for a span of fifty years, trading sometimes 200 to 300 dogs a year at the height of his career. The time was ripe for a person like Heinrich Essig to flourish. Dog shows, dog books, and dog breeds began appearing everywhere. Large dogs, especially white or light colored ones, were all the rage. Our best records indicate that in 1846 Essig declared the “creation” of the Leonberger as a legitimate breed of dog. 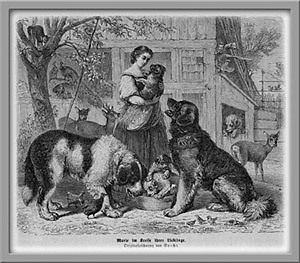 Essig was free to travel and promote his dogs; his niece, Marie, who was known as the “soul” of the kennel actually bred, trained and maintained the animals. Essig’s Leonbergers caught the attention of popular German artists who used the dogs as models and this also increased their popularity. Through Essig’s marketing skill, his dogs found their way into the castles of royalty and the homes of celebrities worldwide. The most famous of the early dogs in the United States belonged to a show business couple, who around the turn of the century toured all of America featuring their Essig-bred dogs, Caesar and Sultan in live theater productions. During this period, Leonbergers participated in the Westminster shows and in dog shows throughout the eastern United States. They are designated and listed in show catalogs and the AKC Stud books from 1887-1902. Like other entrepreneurial individuals, Essig’s strong suit was vision and marketing communications, not attention to detail. Pressed by critics and dog fanciers of the time, Essig eventually wrote that he crossbred a black-and-white female Landseer with a long-haired Saint Bernard that he had acquired from the Saint Bernard monastery in Switzerland. The puppies were, of course, black and white. He reportedly then crossbred these dogs for four generations, outcrossing with a yellow-and-white Saint Bernard and later a white Pyrenean Mountain Dog that he had in his kennels. He was striving at this early stage for an all-white dog, because they were very fashionable at the time. It seems likely that local farm and butcher dogs with relatively fixed genetic characteristics, but not identified as a breed, found their way into the developing breed lines. It wasn’t until Essig’s death that his nephew bred Leonbergers that were consistently representative of the tawny colors and black masks that characterize the breed today. The town crest of Leonberg depicts a lion rearing up on his hindquarters. The crest image has become associated with the breed. Essig died in 1889 without ever having defined a standard for the breed or a defensible description of his breeding program. It is a tribute to the qualities of the Leonberger that in spite of these obvious deficiencies, and in the face of ever harsher critics, that enthusiastic owners formed, beginning in 1891, the first Leonberger clubs. An early club president, Albert Kull, was an artist with an eye for detail. He wrote the first standard for the Leonberger. This standard formed the foundation for all subsequent standards. Kull’s work did much to establish the credibility of the breed, and the Leonberger flourished. World War I: The war almost rendered the breed extinct. If it were not for the determination and dedication of two men, Karl Stadelmann and Otto Josenhans, the breed would surely have become a mere footnote in the history of German dogs. 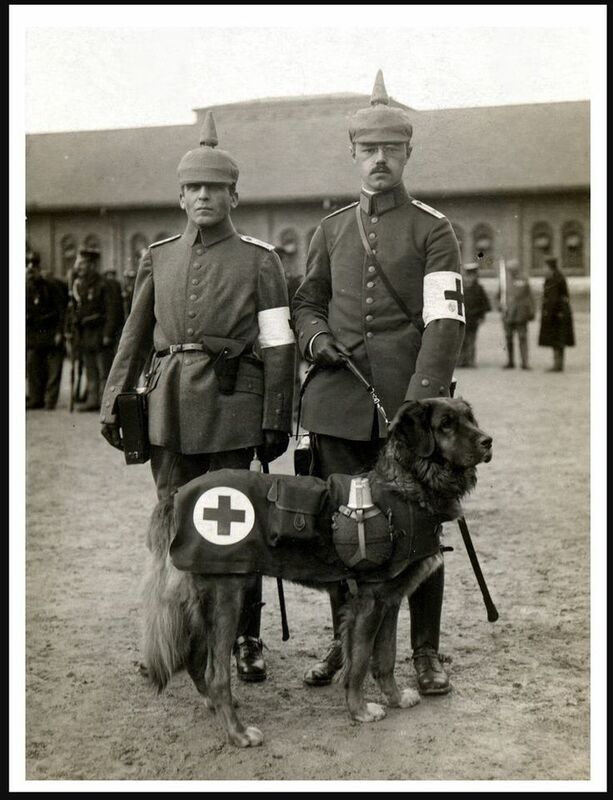 After the War, they scoured Germany searching for Leonbergers. They found 25. Of these, only five were suitable for breeding. Because of inflation and food shortages, it was unlikely that individuals could have personally and individually supported breeding programs, so in 1922 a group of seven people joined together to form a breeding cooperative. Within four years, they had selectively bred 350 Leonbergers. The organized breeding program of the cooperative brought about a revival of the breed, brought honor to the town, and provided foundation stock to establish several kennels. Most notably, these men established the official Breed Registry, which continues uninterrupted today. It is interesting to note that during this time, a pair from the cooperative produced two litters in New Jersey. These dogs were sold throughout America, but all signs of them disappeared during the depression. WWII: In the early 1930s, the authoritarian control of the Third Reich began to influence the dog world, assuming control of all German breed registries. A Reich-governed Leonberger club was established. However, “unofficial? breeding, although very reduced, continued throughout the war in and around Leonberg. 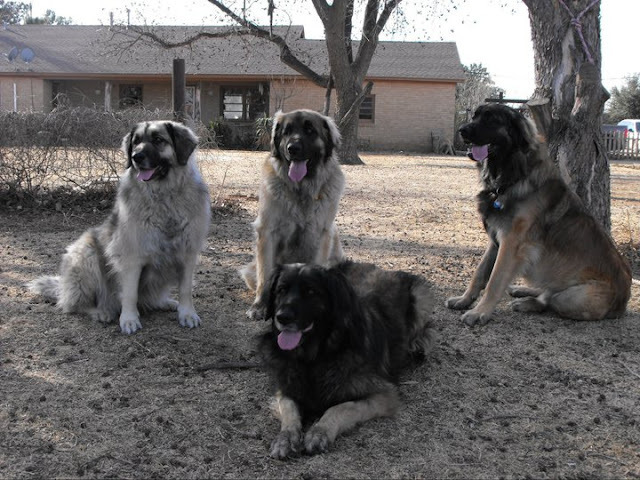 Both dogs and accurate records survived the destruction and the current German Leonberger Club was formed in 1948. Under the guidance of club president Robert Beutelspacher, the first modern-day standard and breeding regulations were written. In 1975, the German Club brought all the Leonberger breed clubs from the major European nations together and founded the International Union of Leonberger Clubs. Eighteen national clubs including the Leonberger Club of America (since 1987) meet annually in Leonberg to preserve and protect the breed. Present Day: Leonbergers are well-known and popular dogs throughout Europe, with standards and breeding governed by national clubs under the auspices of the F.C.I. The rebirth of Leonbergers in America occurred from 1975-1985 when five different families independently brought Leonbergers from Germany to different parts of the country. Through serendipity and persistence they met and established the Leonberger Club of America with an independent registry, code of ethics and a set of breeding regulations. 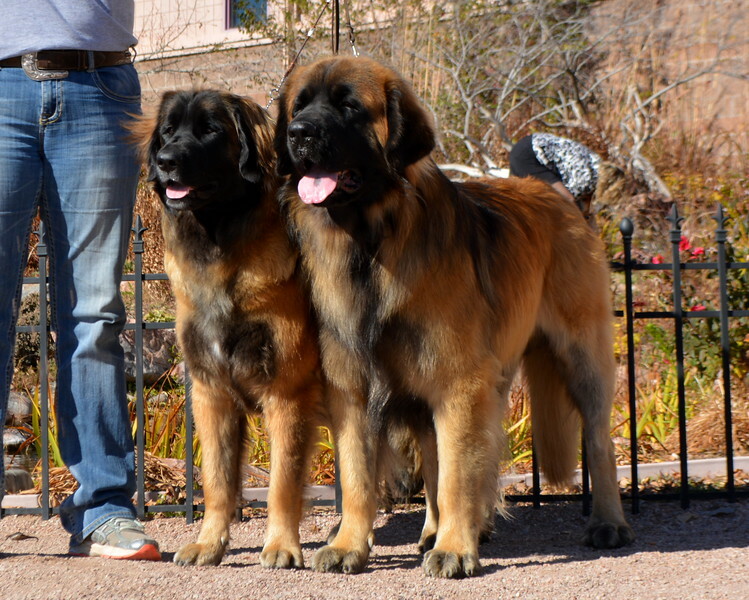 Campbell, Decher, Kaufmann, and Zieher are honored names in the Leonberger world and their breeding and influence continue to impact American Leonbergers. Yves Parent, the LCA Registrar for 27 years, is also counted among the celebrated founders. Is This Breed For You?